Once you have your Scratch program dialed in and you want to remove it from a monitor / keyboard / mouse, you need a way to kick off your program automatically when the Raspberry Pi boots up. 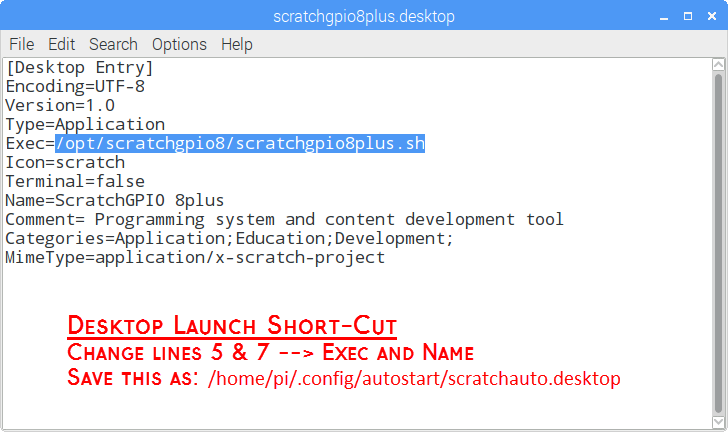 These are a few instructions on how to setup a Scratch program to autoStart. Open up a command-line terminal. Create the auto start shell script. This opens a basic text editor called nano. Now, type in the following 'script'. Then, press CTRL+X, Y, ENTER to save. The file rsc.sb is a default file that will be loaded automatically when Scratch starts. If you want to change this to a different file, you can change it here. Restart the Raspberry Pi and check to make sure that Scratch starts up as expected. Now, find the Scratch program that you wish to auto-start. Save this as rsc.sb in the Scratch Projects folder. Make sure that any initializations or other blocks that need to be executed are tied to the When Flag Event block. This is automatically kicked off when Scratch is started in Presentation mode. If you are going to be running this headless, it's suggested to add some kind of unique boot-up blinking sequence so that you know when the computer has completed its boot-up cycle. Create the desktop launch short-cut. Similar to the way we did it with Scratch. Right-click on the ScratchGPIO8plus icon on the desktop and select Text Editor. Using the file browser, navigate to /home/pi/.config/autostart -- Be sure to delete or remove the scratchautostart.desktop file from this folder s that you don't have two programs trying to control the GPIO pins at the same time.